I know, I'm a bit late to the game with the whole cauliflower flatbread. To be honest, I always just kind of glanced by it when I saw it pop up in the blog world. I can't have cheese, so really, what was the point? Well, Tony was on a vegetable and protein kick for awhile, so I asked if he would be brave enough to try it. He HATES cauliflower. I showed him pictures and he said "sure". So, I made it for him. Well, that sparked my curiosity! I LOVE cauliflower! This looked like dough. It actually came out so well, that he asked for it again. So, I made it again, but I wanted to make one for me too! 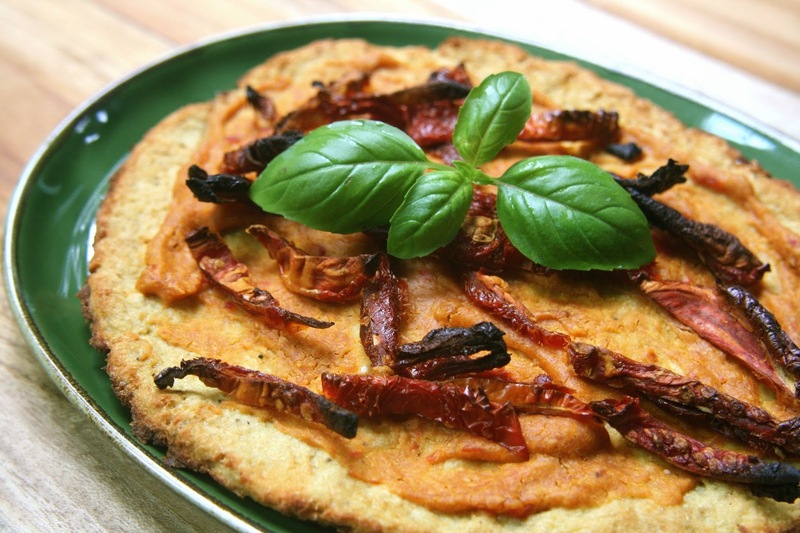 So, this is my cheese free version of cauliflower pizza or flatbread. This crust is so crispy and you can actually pick it up with your hands. 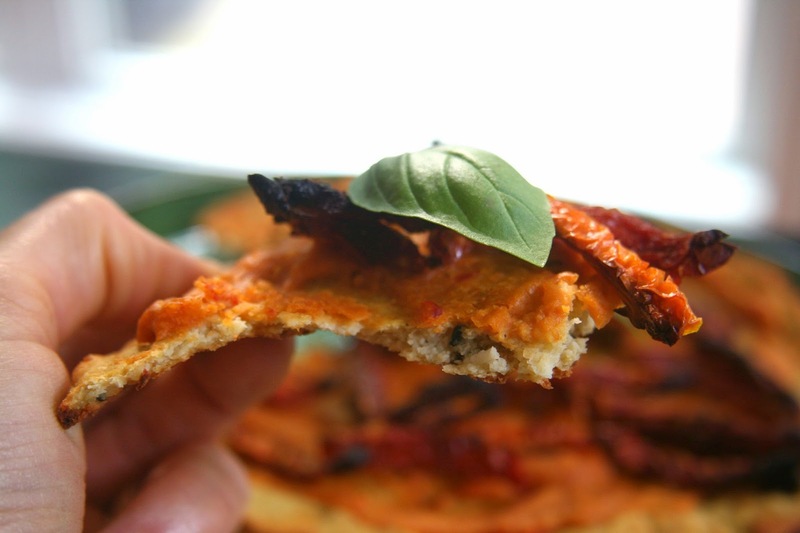 I topped mine with roasted red pepper hummus, sun dried tomatoes and some fresh basil. I never wanted this meal to end! Preheat your oven to 375º. Line a baking sheet with parchment paper. Rice the cauliflower in a food processor. I do this in small batches so I don't over process the cauliflower. Microwave, with the lid on, 10 minutes with a couple of tablespoons of water added to it. Stir at 5 minutes. In a cloth lined colander, put the cooked cauliflower in the cloth and allow to cool for a few minutes. When cool enough to touch (or burn your hands like I do because I'm impatient) squeeze out the excess water. Make sure you get as much water out as you can. Place the drained cauliflower in a mixing bowl. Add the garfava flour through salt to the mixing bowl. Mix well. You should be able to handle it, but if you can't, add a little flour. Bake 20 minutes at 375º. Top with your favorite pizza toppings and bake at 425 degrees 10 to 15 more minutes. I'm sharing this on Gluten Free Wednesday. Just pinned this. Sounds fantastic. I love cauliflower. Jason is ok with it, but not his first choice in veggies. Is it a guy thing? Do you think steaming it will work as well as microwaving? Steam for 5 minutes? 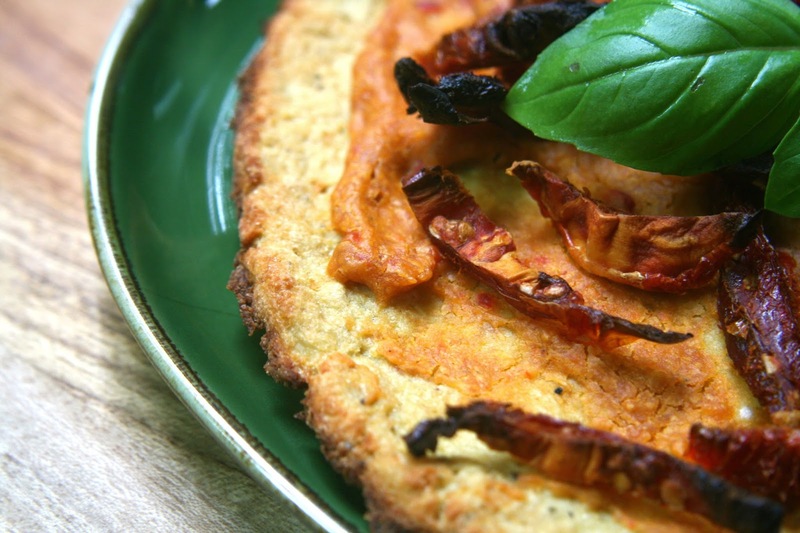 I need to make another cauliflower crust pizza and I LOVE that you did a dairy-free version. Pinning this for sure!! Yes Laura, I do. As long as it's steamed well, it will work. YUM! Can you make this for meeee! oh, say September 16? ;-) Kind of kidding kind of serious!! I tried cauliflower crust before and didn't get enough liquid out so it was a semi fail, but still tasty! The one I do is almost exactly like this, but I use quinoa flour. 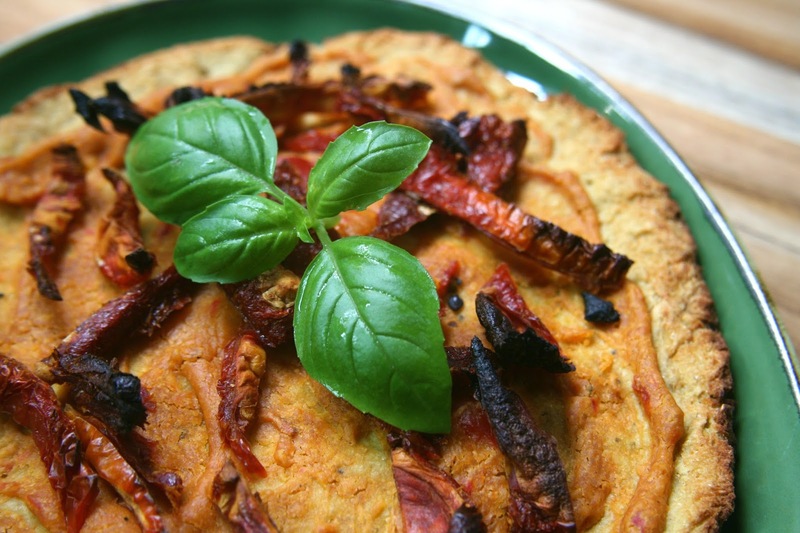 I need to try it with chickpea flour too! I love that flavor. Sounds so good and mind never comes out thin and crispy like that. I must try your way. Love ya friend! Thank You. You can send mother's day great messages to your mother. Thanks for sharing excellent informations. Your site is very cool. I am impressed by the details that you have on this site. It reveals how nicely you understand this subject. You are going to find out here 10th Class Result 2017.